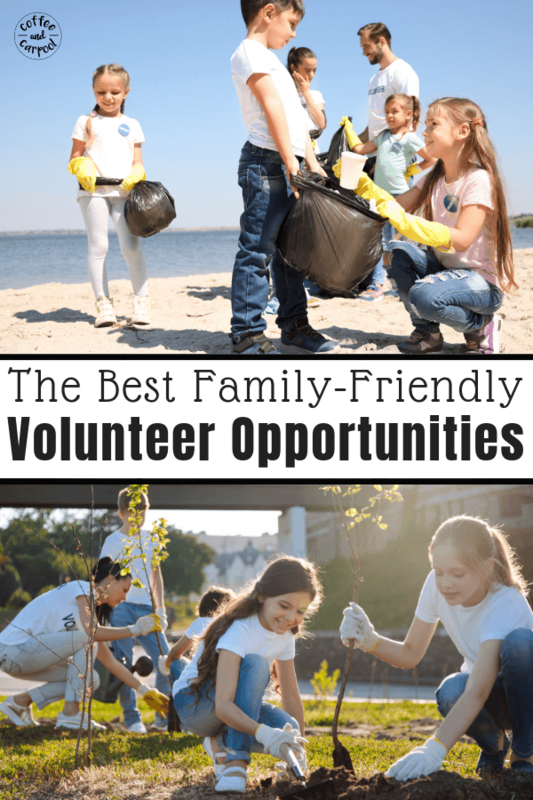 Inside: Pick something off this list of family-friendly volunteer opportunities to spread kindness and participate in community service projects with your kids. My kids and I were sneaking in some fast food dinner in between karate and scouts. We were meeting my husband and exchanging kids and gear in a parking lot. It was just one of those nights where we ate our dinner in the car and made the best of it. As we were eating our tacos and trying not to get lettuce all over my car, my kids noticed a gentleman sweeping the sidewalk in front of an abandoned storefront. He was meticulous with his job. Then we laid out a blanket and laid down. It was the dead of winter in Chicago and my kids gasped in horror. He must be so cold. Is that where he’s sleeping for the night? He must be so hungry. They had a million questions and I had very few answers. But I did have an extra taco. So my kids and I got out of the car, walked up to him and said “Hi.” We offered him a taco and then we wished him to stay warm through the night. It wasn’t much. It was literally a $1 taco. But the message to him was important. Someone cared about him and his well-being. And the message to my kids was even more important. We take care of people. We help people when we can. Because we are kind people. And I want to expose my kids to more big acts of kindness. Big opportunities to serve our community, help those who need it, and volunteer with organizations who are short on money, supplies and people with extra time. But it can be hard to find family-friendly volunteer opportunities that families can participate in together. Most service projects and organizations that need volunteers do not want 5-year-olds. Older kids and adults can almost always find a way to volunteer their time. But little kids? It can be tricky to find ways for them to make a meaningful impact in their community if you don’t know where to look. We are raising kind kids. We expect it, we praise it and we model it. But we tend to focus on the quiet, normal, everyday moments of kindness. Holding the door for the person behind you. Picking up something someone dropped. Offering your seat to someone who needs it. But there’s also bigger, grander, more time-consuming acts of kindness. Times when we donate to our local food bank. Or collect all our old jackets and take them to a shelter that needs them. Or when we take a taco to someone who’s really hungry. Our kindness may not change the world. But it can change the world for the people we help. And it instills in my children the fact that volunteering and acts of service are a normal part of lives. Helping others doesn’t need to be a once a year activity during December when we donate a toy or two. People are hungry year round. Animal shelters are full year round. Kids are sick year round. And we can help. Because we are helpers. We are raising our kids to be helpers. As an added bonus (as if we needed one more reason) volunteering as a family is an incredible way to connect as a family and build a strong family identity. But where should we volunteer? And where can young kids volunteer? There are so many wonderful family-friendly volunteer opportunities, it can be hard to pick where to donate your time, money and energy. So the best place to start is to talk with your family. What are your interests? What is important to you? What really pulls on your heartstrings? Do you have a family member who benefited from the services somewhere and you want to pay it back? Is there a cause that just breaks your heart and you want to make a small difference? 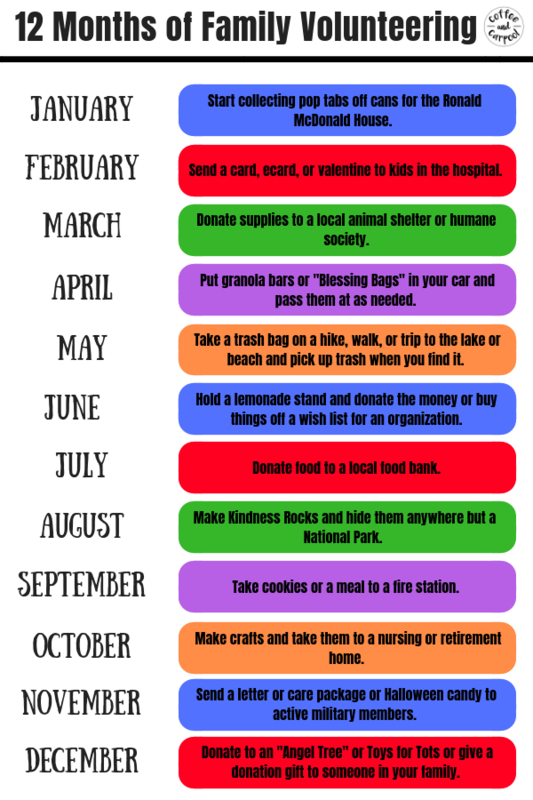 Or, choose a different cause each month of the year and set a goal to give back at least once a month. *Many service organizations are supported by or run by a religious institution. 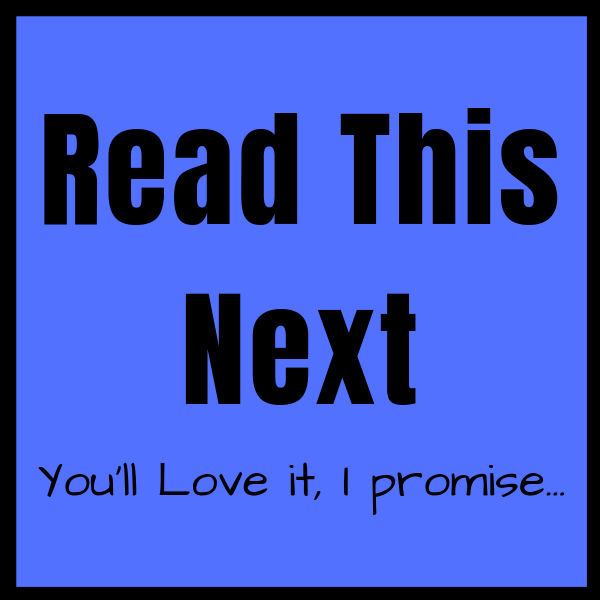 So many non-profit companies and organizations have religious foundations, missions, or messages on their website. Please know that for 90% of them, you don’t need to be a certain religion or even religious to participate or donate your time or goods. Plus, it may be a great way to expose your kids to a new culture or religion. For a general idea of volunteer opportunities available to you, start here. 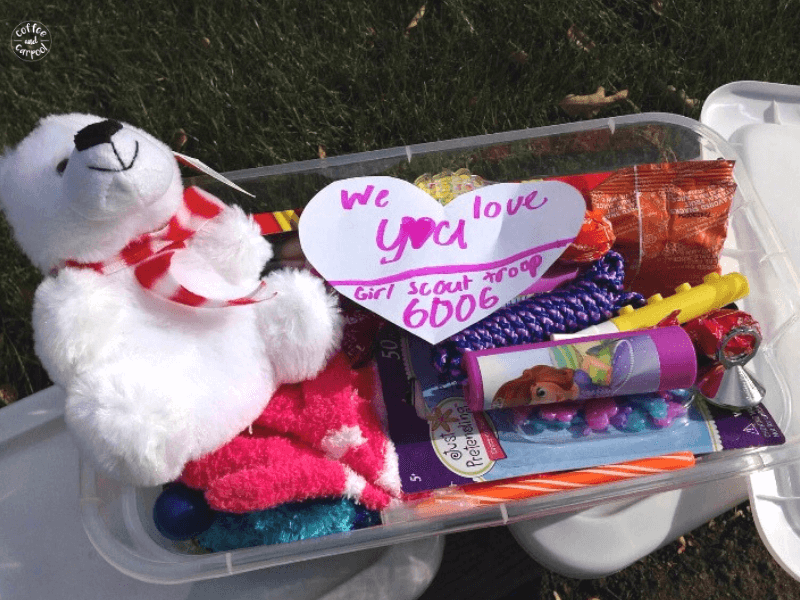 Many families keep “Blessing Bags” in their cars to hand out to people asking for donations on the side of the road. Organized 31 has some great ideas on what to include in one. I keep a box of protein granola bars in my car to hand out with my kids. I’ve bought groceries for a family asking for food outside of a grocery store. I just bought a coffee for a gal who came into the restaurant I was in to get warm. There are opportunities everywhere if you look. The key is not assuming. Ask. Ask if you can help, don’t assume. It is estimated that 13-16 million kids live in families that have a “food insecurity.” Meaning they don’t know where or when their next meal will come. My pantry is stocked and my kids have never known hunger. This is the least we can do so fewer kids and families wonder if they’re eating dinner tonight. Most towns have a food bank that constantly needs restocking and most people donate food to food banks during November and December, which is amazing. But people are hungry year round. Kids who are on free and reduced breakfasts and lunches get very little food during the summer months when school is not in session. Check the website of your local food bank and print out their list of most needed items. I keep it in my purse and have it out when I grocery shop. My kids help pick a few food items off the list during each weekly shopping trip and then when we donate to the food bank once a month with all the groceries we collected. You can also participate in Stamp Out Hunger sponsored by the US Postal Service in May and Scouting for Food sponsored by the Boy Scouts of America. 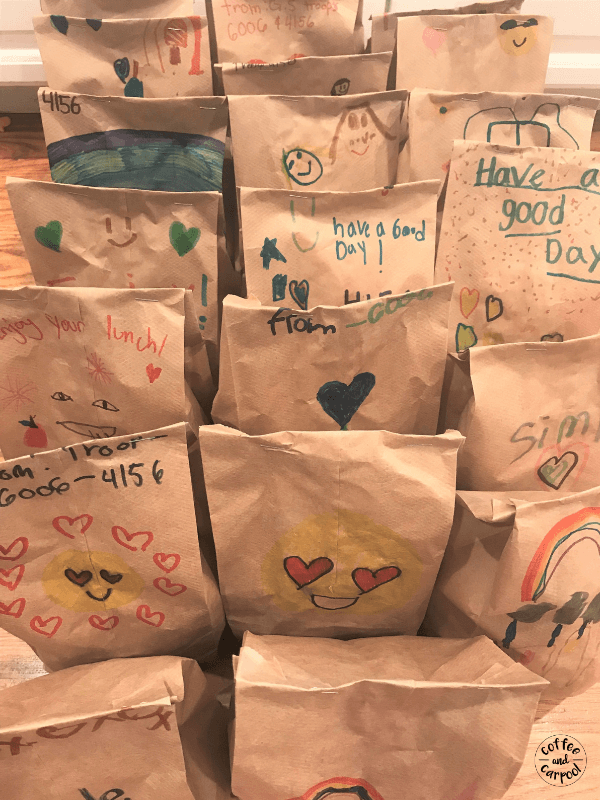 My kids have decorated sack lunch bags and filled them for a homeless shelter so people staying overnight would leave with a ready to eat lunch. Creative Family Fun has super unique ways to help fight hunger as a family that my family can’t wait to partake in. Feed my Starving Children– Kids are able to put together meals that will be shipped all over the world. They have locations in Arizona, Illinois, Minnesota, Texas and organize mobile events. My Stuff Bags– Collect blankets and new stuffed animals to deliver to kids who are entering the foster system and leave all their belongings behind. You can collect items or if you live in Southern California, kids 10 and up can fill the bags. Cradles to Crayons– They have locations in Boston, Philadelphia and Chicago and collect and deliver school supplies and books to kids who need them. Ages 5 and up can volunteer or you can donate supplies. There are tons of other organizations near where you live that need support and volunteers and wishlist items fulfilled. Operation Christmas Child Shoeboxes-Every November they accept donations of shoebox-sized boxes filled with goodies, gifts, and toiletries for young kids who otherwise wouldn’t get any holiday gifts. My kids and I went to the local dollar store and filled up several shoeboxes and then donated them. They also collect small financial donations to help with the shipping. Toys for Tots is a fantastic way to help kids who won’t have Christmas presents under their tree. Donations boxes are everywhere during December including fire stations and grocery stores. Angel Trees- Many malls and stores have “Angel Trees” asking for gifts for a specific gender and aged child. My kids each pick one off the tree, go shopping, and return with the unwrapped gift. We try to pick kids who are the same ages and gender as my kids since this seems to make more of an impact on them. Add a White Envelope to Your Christmas Tree– Instead of one more present under your tree or around your menorah, make a donation to an organization near and dear to the recipient’s heart, in their name. Send a kid to camp. Buy sports equipment to for a local high school that has no budget. Sponsor an endangered animal. Give less stuff at the holiday time and give back at the same time. 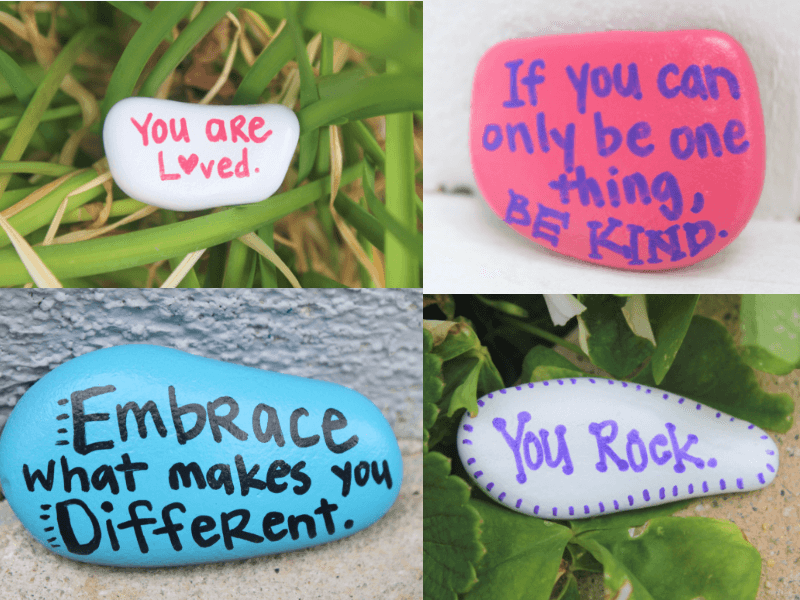 Let your kids pick what they think each recipient might like to receive as a donation in their name. Donate a Gift Night- If you celebrate the 8 nights of Hanukkah and give your kids 8 gifts, you can give them 7. On the 8th night, it’s their night to give back to an organization and donate gifts instead of receiving them. Domestic Abuse- To help women and children who are affected by domestic abuse, you can find your local domestic abuse shelter and click on their wish list. These facilities almost always need toiletries or new underwear and socks for the kids and the mamas. Local Nursing Home/Retirement Center- We often make seasonal or holiday decorations and drop them off to the receptionist of our local nursing home. These colorful kid crafts always brighten up the hallways, common rooms and cafeterias. If you have time, visit with the residents or organize a caroling event during December. Active Military- Support our men and women overseas by participating in Operation Gratitude. Encourage your kids to send their excessive Halloween candy, thank you notes, and small packages as a thank you to our armed forces. 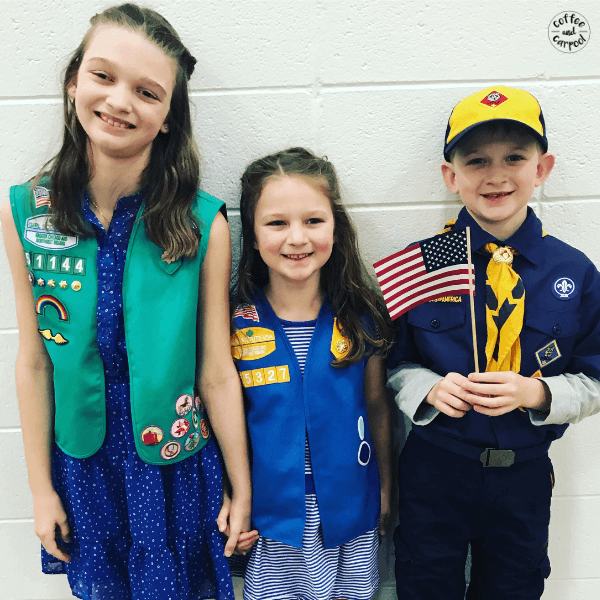 During Girl Scout Cookie Season in the winter, you can purchase a box of cookies through “Gift of Caring” and Girl Scouts will send the cookies to deployed troops. Hospitalized Children- If you’ve ever had to step inside a Children’s Hospital, you will immediately want to do anything in your power to take some of the pain away from these families. And while donations won’t magically cure these sweet babies, your donation of crayons and books will bring a smile to their faces. Find your local Children’s Hospital and click on their wish list. Or your kids can send in a greeting card to a child in the hospital or an ecard or Valentine’s Day Card (Just make sure to respect their guidelines so the cards are appropriate and safe to give to the patients). Animal Shelter/Humane Society- If your family loves animals, a simple way is to donate supplies to your local animal shelter. My kids and I have made fleece blankets and donated them, dropped off unused toys and collected paper towels. And we took it one step further and brought home one of their puppers. We just couldn’t leave her behind. Want more ideas? Creative Family Fun has great ideas on how to support your local animal shelter. And the Gifty Girl has a Summer Volunteer Challenge for tweens that would be perfect to use with all of these organizations. One of the simplest ways my family gives back is by helping the Ronald McDonald House. If you visit their website, they have a wish list of items they need. But they also need pop tabs to help fund families staying in their houses so they can be near the hospital where their child is getting treatment. My kids pull the pop tabs off of fizzy waters, sodas, and beer because each one magically helps pay for families to stay together. Your kids can also hold a bake sale or lemonade stand and donate the money they earn to a cause they care about or use the money to purchase items to donate. It may seem small, but big things can happen from simple lemonade stands, like Alex’s Lemonade. 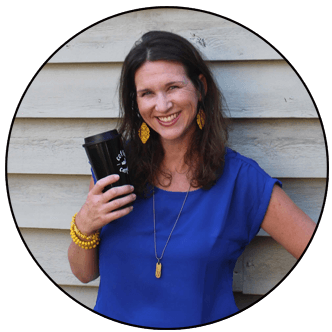 Or start a Family Challenge with a Service Scavenger Hunt from One Creative Mommy and help out your neighbors. Participate in town beautification projects sponsored by your town or city. Our town has one every spring and families can sign up for the project that is appropriate for the ages of their kids. We usually forgo painting over graffiti for trash pick up near the high school. Take a trash bag with you when you go on a hike, a walk or to the beach and pick up trash. 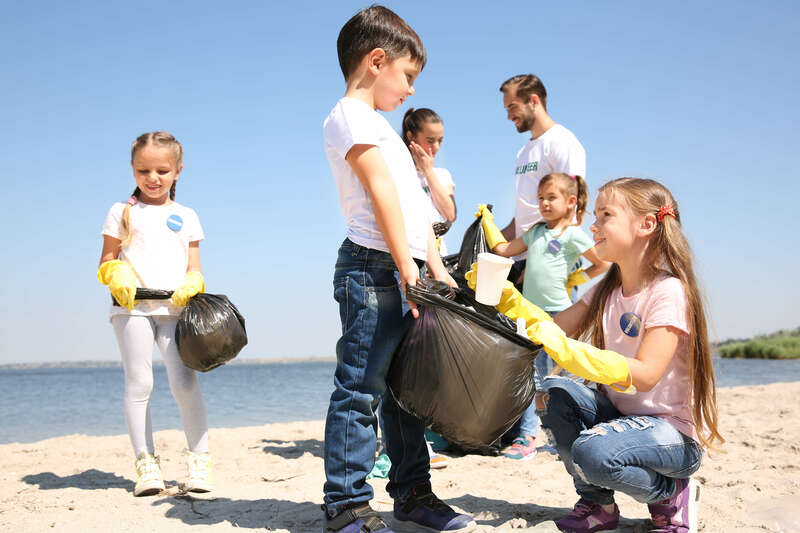 Or you can participate in an organized event like Heal the Bay and they’ll provide the trash bags and gloves for you and your kids. Check to see if your town has a Day of Service. When we lived in Boston, Cambridge had an MLK Day of Service that was incredibly organized and family-friendly. Participate in your local school or library’s book drive and collect books you no longer read so other families can enjoy the books. Or donate them to a local thrift store or a Little Free Library. Help families get warm by collecting all of the warm coats your family has outgrown. There are usually boxes or bins in grocery stores or restaurants to collect the warm jackets. Or you can click here to see where you can donate your used winter coats. 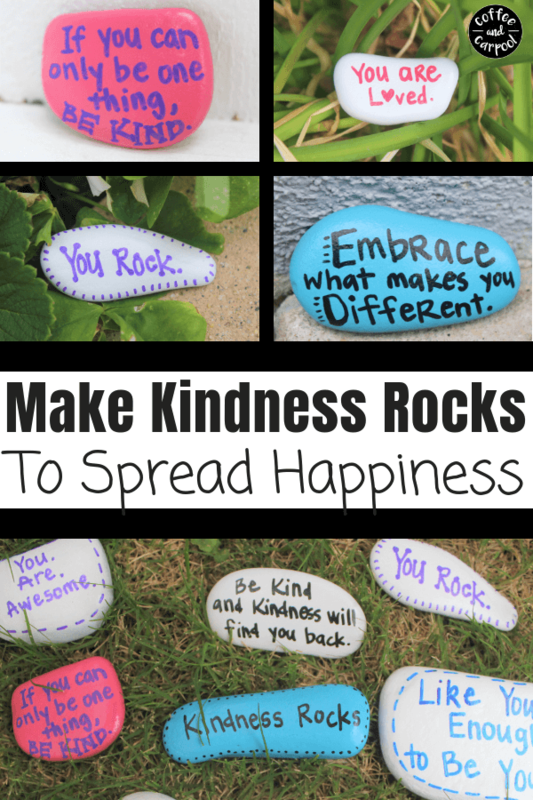 Spread some kindness with these Kindness Rocks that are simple for kids to make and hide. Volunteer to make meals for your local firefighters by calling the firehouse and asking if you can bring them dinner. I doubt they’ll say no. We had a horrific fire sweep across our community and as a small thank you to the firefighters who saved so many buildings and kept us safe, we’re making them some chili. They’ll have a night off from cooking and can keep a little bit more of their paycheck in their pocket. And we almost always take cookies to our local fire station on the anniversary of 9/11. It’s a small way to thank them for choosing the profession they chose on the day where so many firefighters ran into the buildings without questioning their own safety. Volunteering as a family is important and the opportunities are quite endless. But you can also encourage your kids to join scouts for even more volunteer opportunities. With my Girl Scout troops, we’ve made sack lunches for a homeless shelter, collected school supplies for kids in need, made gratitude bags for active military, hosted a holiday party at a local Ronald McDonald House and volunteered at a pet rescue. My son’s Boy Scout troop has made blankets for families in a shelter, volunteered at a Feed My Starving Children location, and lay flags and wreaths at military graves throughout the year. And all three of them volunteered at the local Veteran’s Day Event. Here’s the bottom line. Even if your family does one act of service this year, it will be worth it. If your family can do one a month, it’s even better. But don’t feel pressure to volunteer. Know that when your kids are babies and toddlers, family volunteering is probably not going to be high on your to do list when you’re sleep deprived and potty training. And that’s okay. If you’re up for volunteering with toddlers, Extremely Good Parenting has a great list of ways to get toddlers involved in family volunteering. 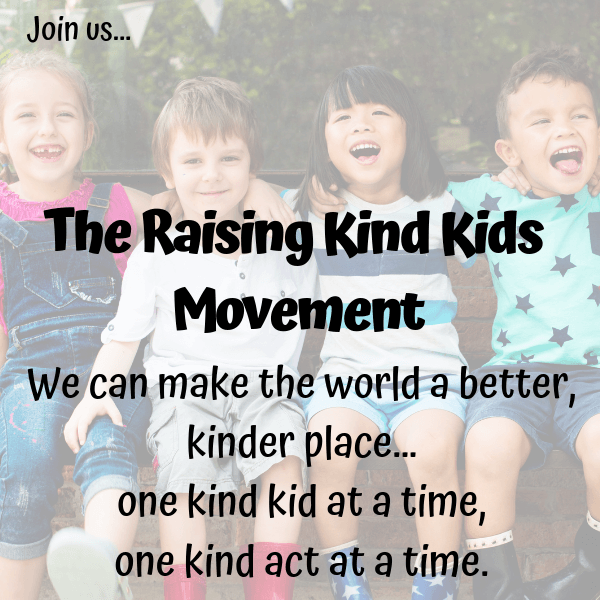 But when your kids are older, when you’re looking for ways to give back and spread even more kindness, jump in. Talk to your family about how they want to participate in the community. Even if it starts with a $1 taco.